Every year as part of the fifth grade curriculum, students at Leo Baeck Day School in Toronto participate in “Project Giveback” by presenting an overview of a charitable organization that is meaningful to them. This year, James Levin, 10, chose Gift of Life Marrow Registry. 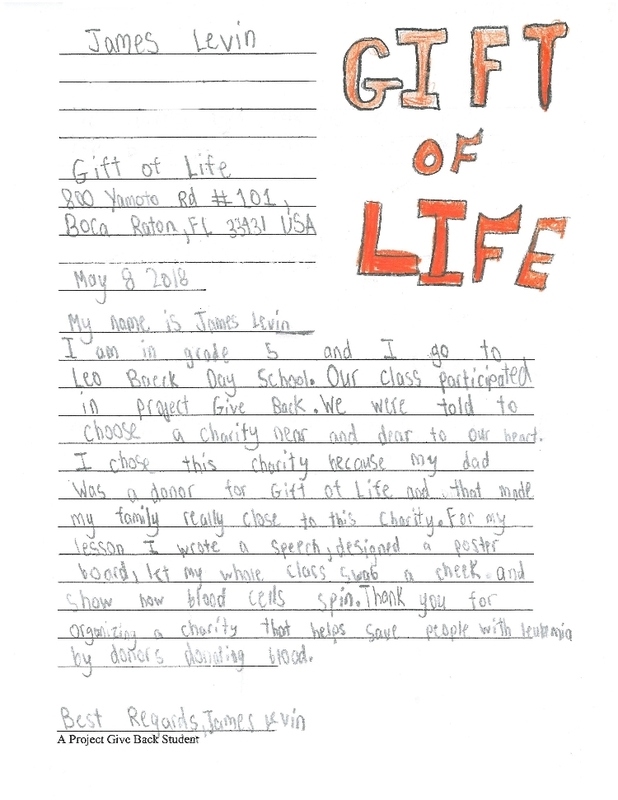 For his project, James created an informational board about Gift of Life explaining the organization’s lifesaving mission, demonstrated how blood cells are separated in order to collect only the stem cells, and gave all his fellow students the chance to swab their cheeks. The kids used their swab kits for practice only. Donors must be 18 years old to join the registry. Michael says that when they grow up, James and his brother Jack would both like to become veterinarians and start a practice together. Justin expects the unexpected, so the call that he was a donor match for a 62-year-old man suffering from leukemia was a welcome one.